Shelley Farmer and Greg Balla in You Can’t Kiss a French Movie. Photo by Emma Wainwright. BOTTOM LINE: A multi-media show that borrows from French New Wave to create a dialogue between theater and independent film. Agnes (Erin Healani Chung), an awkward production assistant dressed all in black, makes her way to the front of the audience to give the usual theater announcements about fire exits and cell phones. Her badly hidden nervousness and excitement puzzle me for a moment. Is this for real? Or has You Can’t Kiss a Movie already begun? 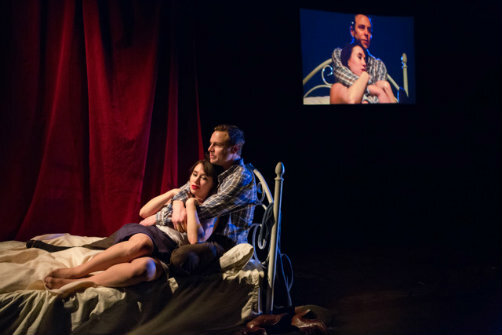 This experimental play by Shelley Farmer and Alex Hare is designed like a Russian nesting doll: it’s a movie shot on a theater stage, and is inspired by French New Wave films. Lola (Shelley Farmer) is a cabaret singer in love with Michel (Greg Balla). Introduced to us through the camera that's in the hands of the Cameraman/Director (Adam Weppler), which projects onto the screen in front of us, they first appear offstage behind the curtain. Cinephilia has a voyeuristic nature, which director Alex Hare cleverly emphasizes by staging some scenes in spaces fully or partially obscured from the audience and faithfully streaming everything on the big screen. But is the camera gaze objective or objectifying? Farmer and Hare make the case for the latter. In order to confront the male gaze, they entrust the camera to three “volunteers,” a man and two women. They are called by name for particular scenes and are quickly instructed on the spot about what to film and how to frame. I wasn’t sure if they are indeed random audience members—only after speaking with one of the women I found out that they were recruited just before the show. Although an interesting experiment, including random audience members doesn’t bear any artistic fruit. At least in the evening that I attended, everybody followed the crew’s instructions and didn’t use the chance to somehow liberate the actress from the dictatorship of the objectifying camera gaze. Is the patriarchal view of the world to blame, or is it simply stage fright and the responsibility of handling an expensive camera? Whatever it is, the participation of the audience seems unnecessary. Farmer eventually takes the initiative into her own hands and overthrows the authority of almighty Director/Cameraman. You Can’t Kiss a Movie, styled after the films of Godard, tries to be less of a nostalgic sentiment of the past and more of a cautionary tale for modern filmmakers. It teaches us to take matters into our own hands in order to tell our own stories. Unfortunately, the feminist message of the finale feels forced. Cinematic beauty is the play’s strongest feature. Even though the few elements of the sets, designed by An-Lin Dauber, are right before our eyes, they come alive on screen anew, touched by movie magic. Lighting design by Jennifer Fok and camera work by Adam Weppler make the picture on the big screen irresistibly delicious. The only movie scene that is pre-filmed (as opposed to live-streamed) takes place on a train platform on a beautiful, snowy day. Farmer and Balla are recording a voiceover for it. The slight discrepancy between the lip movement and actors' voices doesn’t allow us to slip into somnambulistic film-watching mode. This encourages watching and listening critically. But the beautiful black-and-white image draws us in, making a strong argument for the artistic craft that filmmaking requires. Having the noble intention behind the beautiful picture is perhaps more important, but You Can’t Kiss a Movie doesn’t make a very strong argument in the ideological department. However, the show is a success in facilitating dialogue between theater and film. In most multi-media productions, video projections are merely a tool, a window to a different time (Dodin’s Cherry Orchard, where home films illustrate how happy life once was), space (Van Hove’s Kings of War, where the entire labyrinth of backstage is only visible through the live-stream) or the depths of the human soul in the actor’s close-up (Thomas Ostermeier’s Richard III, where the power of the final monologue is doubled by the blown-up video of Richard’s face). You Can’t Kiss a Movie, being a theater show about movie making, takes the capabilities of live-streaming even further in the scenes where the interaction between the actors and the projection are simultaneously unfolding next to each other. The intimacy of HERE’s downstairs theater allows for a similar reality-to-screen scale ratio, which essentially means that you see the same scene twice in the mirror-like effect. Except that the reflection is subjective, and represents the vision of a person behind the camera. This is where the show makes its strongest argument, even before any words of rebelling feminism are spoken. You Can’t Kiss a Movie is by Shelley Farmer and Alex Hare. Directed by Alex Hare. Produced by Madeleine Goldsmith. Set and Costume Design by An-Lin Dauber. Lighting design by Jennifer Fok. Original Music by Michael Gildin. Sound Design by Gabriel Lozada. Film Consultation by John Zhao. The cast is Shelley Farmer, Greg Balla, Erin Healani Chung, and Adam Weppler.